The most commonly used vinyl replacement window in the USA today is a double hung window. Double hung windows get their name from the double set of sashes that traditionally were hung from counter weights inside the window frame. The counter weights allowed the sashes to be lifted or raised with less effort. They also allowed the sash to stay in position while raised. Today, double hung windows rarely use counter weights. Instead, either spring balances or steel coils are used to balance the weight of the sash as it is raised and lowered. Durability and excellent lift action: Each Premium Vinyl Windows double hung window is built with either Constant-Force™ balances to make lifting or lowering your windows effortless. Easy cleaning from inside the home: Every Premium Vinyl Windows double hung window tilts in to make cleaning a snap. Just push the button at either side of the sash and tip the sash toward you. Minimal air infiltration: Specially designed air barriers and weather stripping greatly minimize air leakage. Innovative sill designs: A strong bond between the window’s sill and jamb provide maximum weather protection. Energy efficient glass packages: No matter what your energy efficiency needs are, Premium Vinyl Windows' numerous glass packages can meet them. 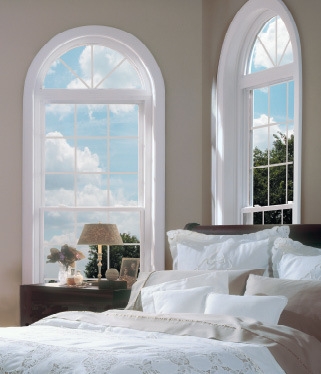 Peace of mind: Vent stops are designed into every Premium Vinyl Windows double hung window. The vent stop allows the sash to be raised partway for ventilation yet prohibits someone from pushing the sash open all the way.